On Christmas Eve at the age of ten years old, I saw a video that blew my mind. After we finished opening presents with my family, my Aunt Marie popped a tape into the VCR (yes, I’m dating myself here). On this video was my Aunt Marie jumping out of an airplane, screaming at the top of her lungs with two thumbs up the entire time. 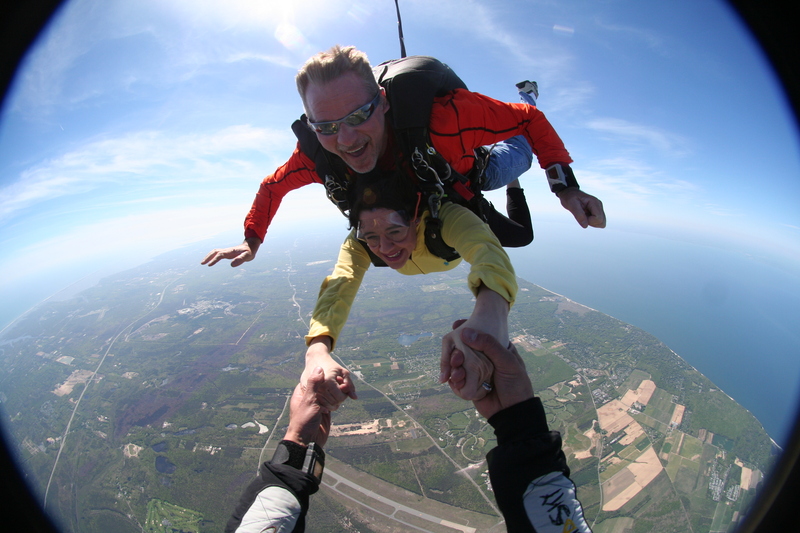 She had decided to go skydiving for her 35th birthday. Of course, she had not told anyone before she went, so this came as a surprise and a shock to my entire family. This especially caused a bit of an uproar with my Grandfather who screamed, “You have two beautiful children, what the hell is wrong with you!” I, on the other hand, thought this was the coolest thing I had ever seen. I decided then and there that this was something I would do in my lifetime. 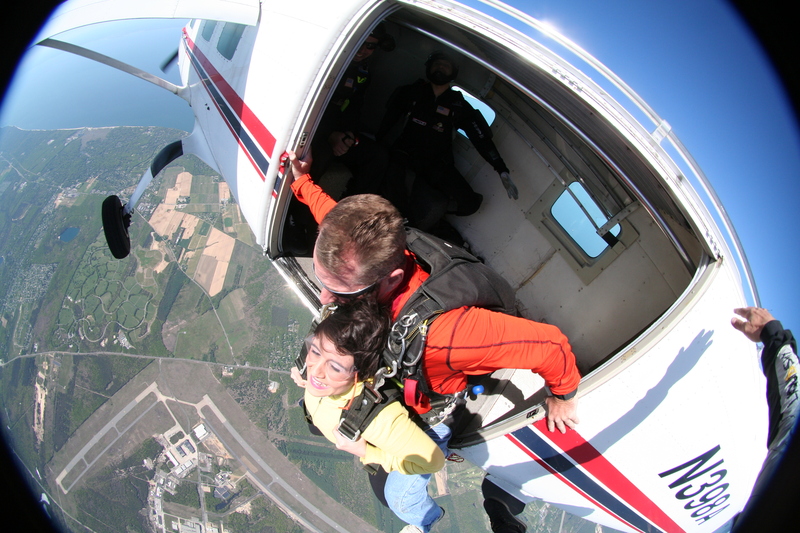 I begged and pleaded with my Aunt Marie throughout the years to take me skydiving, but she feared the wrath of my Grandfather, and there was no way she was going to be able to take her niece without getting hell from the rest of the family, including my parents. Fast forward to about one month ago. My husband planned an entire surprise weekend to celebrate our upcoming one year wedding anniversary, but he was not able to contain his excitement any longer. 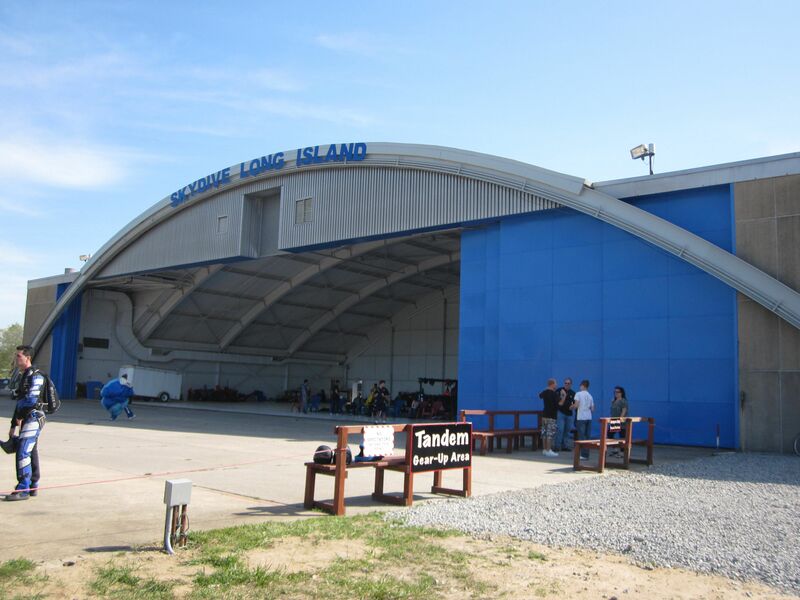 He spilled the beans that the surprise was that we were going SKYDIVING in Long Island! So I must have been totally excited right? WRONG!!! I completely hyperventilated, couldn’t breathe, my heart was beating a mile a minute, I started crying…the works. 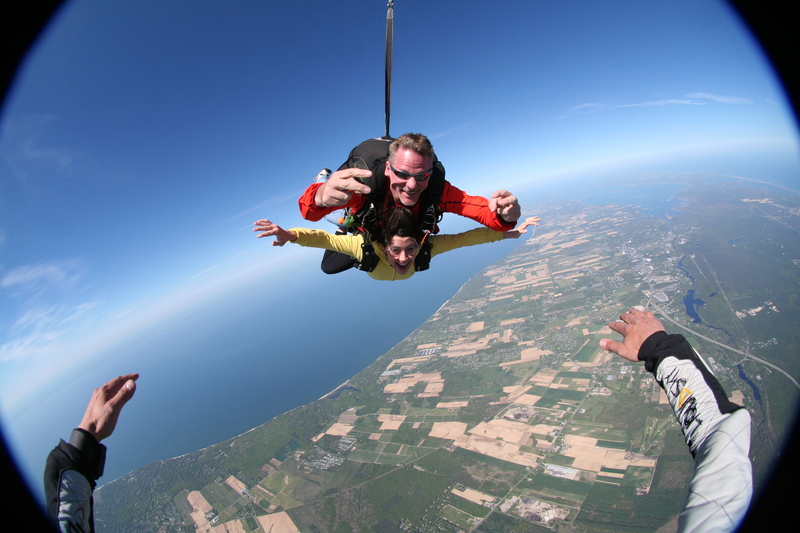 I suppose that although I had always wanted to jump out of an airplane, the reality set in that I WAS GOING TO JUMP OUT OF AN AIRPLANE. This was actually going to happen, and this was no longer a wish list item…this was for real. I honestly expected Zack to plan a nice, quiet, romantic weekend in Upstate NY or something similar. I expected to relax, maybe go hiking or camping, spend time in the outdoors and get some peace and quiet and alone time together. 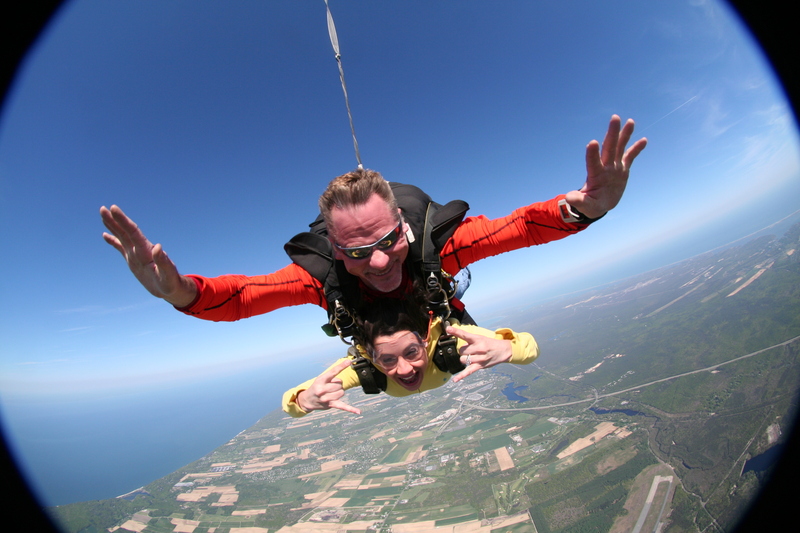 And then he tells me we are going skydiving! I think I was just completely and utterly shocked, and could not believe this was actually going to happen. It also wasn’t happening for another three weeks, so I had to freak out about it until then. Of course I also chose not to tell my parents, or anyone really, beforehand. I think I maybe told a total of two people before going. That decision was not only because I knew my mother and sister would completely freak out, but also because I didn’t want any naysayers whatsoever telling me anything that might freak ME out. I was determined to go through with this, and I tried to clear my mind of any worry until it got closer. 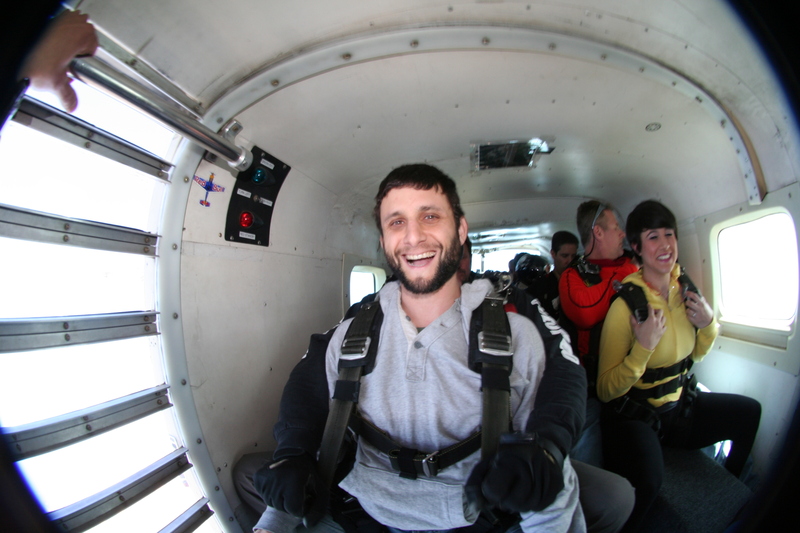 On the day of the big jump, I was actually fairly calm leading up to the event. Zack and I had a nice breakfast together at the place we were staying in Long Island to celebrate our one year, and we went for a nice, long walk on the beach prior. As we started getting closer to the airport, I began to get a little bit nervous. We checked in, watched a safety/instruction video, and signed our life away with about 27 signatures and initials. We then waited for about 45 minutes in anticipation and watched other jumpers until we were called to suit up. I was surprised that we didn’t really have to wear much gear other than the harness and a pair of glasses to protect our eyes from all the wind. 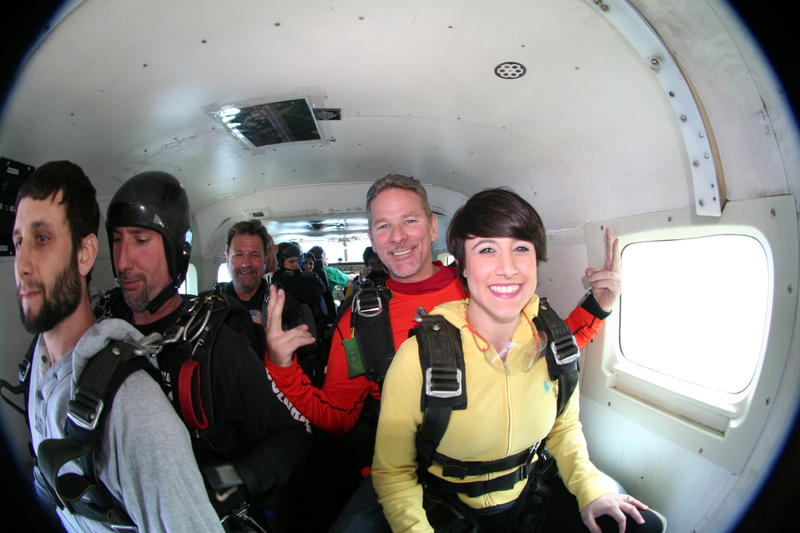 My nerves were kicking in a lot more at this point when we loaded into the tiny plane and took off into the air. I have to say, this was probably the scariest part of the whole experience. 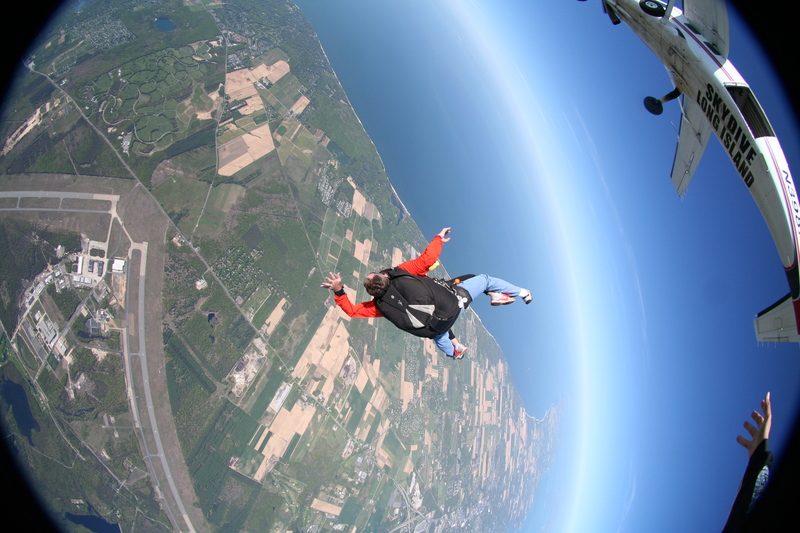 When we got high enough, the plane slowed waaay down, and it was time to take the plunge. Zack jumped first as I yelled, “I love you!” and then it was my turn. The photos and video that we paid for are completely embarrassing, but so real! I went into meditation mode where I closed my eyes, laid my head back on my instructor’s chest, and started taking deep breaths. At this point, I realized that I was helpless. 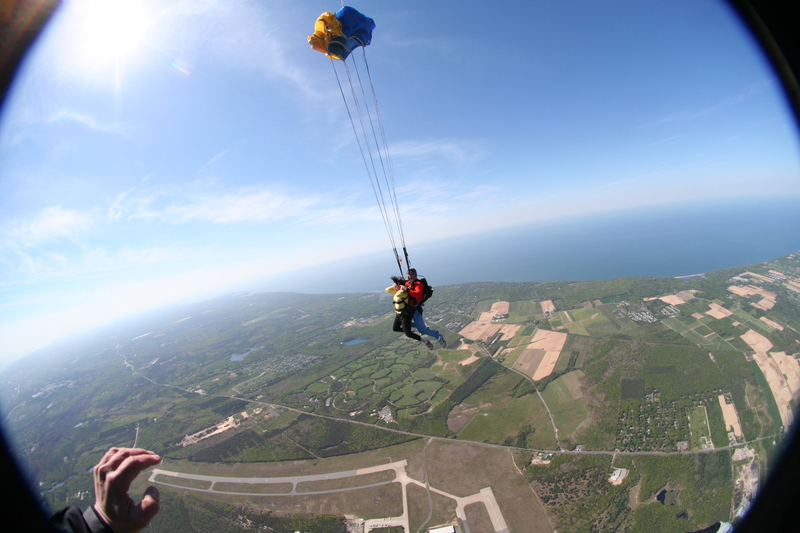 The only thing I could do was trust that my instructor knew what he was doing and that the parachute would open. Freaking out would do nothing to help me at this point. That being said, looking back at the footage, I look like I am in labor, or possessed, or lifeless. It’s pretty hilarious, and completely 100% embarrassing. My videographer tapped me on my head to let me know “it’s going to be okay” and at that point I opened my eyes and let out a big smile as we rolled out of the plane. I didn’t believe anyone when they told me I wouldn’t feel that roller coaster drop feeling in my stomach. But everyone was right. 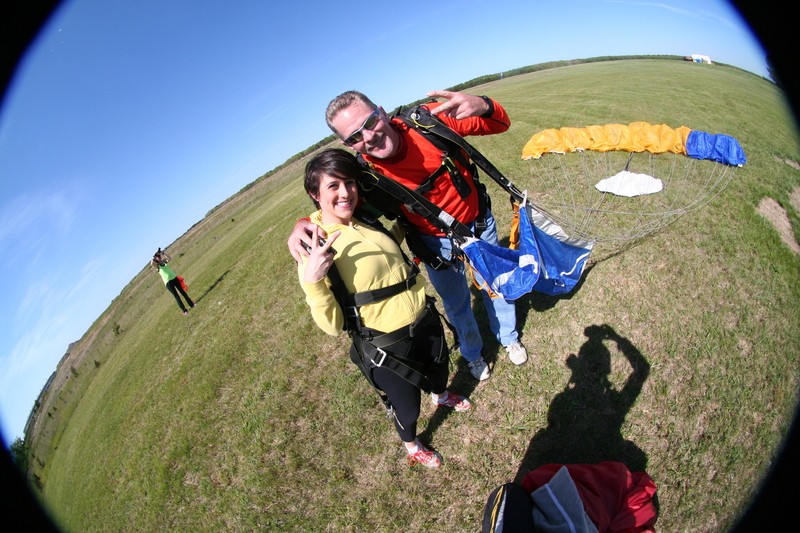 I maybe felt a slight drop for half a second as we plunged head first out of the plane, and then it was all WIND. Maybe it was all in my head, but it felt a little tough to breathe. I tried to scream, but so much air was coming in that nothing could come out! My videographer grabbed my hands and we spun around in circles which was pretty cool, and he coached me to make funny faces for the camera. We free fell for about a minute, and I really never got the notion that I was falling. It could have been because there was no perspective (we weren’t passing anything on the way down), or that the ground was so far away, it never looked like it got any closer. It just felt like I was in a static wind tunnel. It was a feeling like no other. 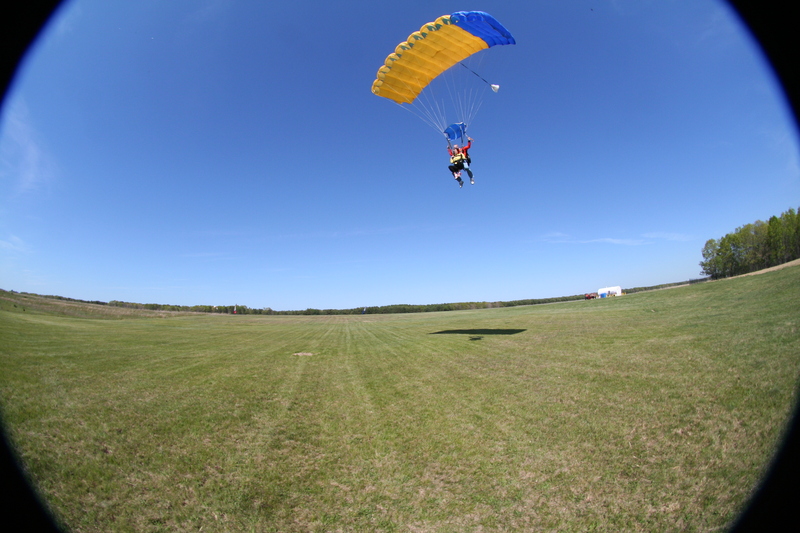 After a minute, my instructor pulled the parachute and we went shooting up. We floated around for a bit and he turned some fun circles while we took in the gorgeous views around us. And then it was landing time! We both landed perfectly, and snapped a few victory photos once we were done. It all happened so fast. 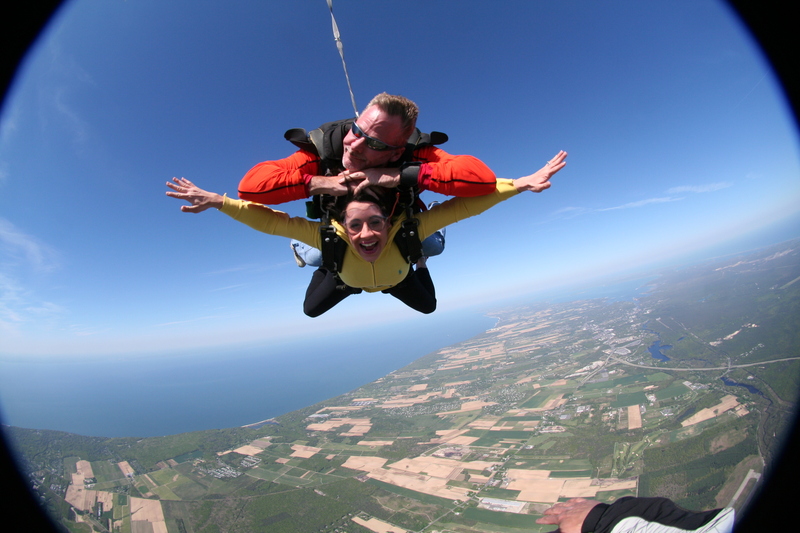 While we were waiting to receive my video, we couldn’t believe that it was over, and we had just jumped out of an airplane! It honestly felt like it wasn’t real life, and that we didn’t jump yet. It was a very surreal feeling that is hard to explain.